Adding color to your home lighting is a perfect way to add small nautical accents to your coastal style home. Our favorite Fabby color, Honorable Blue, reminds us of the deep blue ocean. The key to coastal style is to keep it simple. 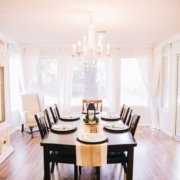 The style is light and airy, features natural materials, and praises crisp clean lines. Coastal interiors use a calming palette with lots of white and light neutral colors that, unlike bold colors, lack drama. White is the predominant color in coastal design because it reflects and spreads light rather than absorbing it, making it feel spacious and fresh inside. The coastal style aims to make the indoors feel uncluttered and bright as if you are outside on the beach. If an all-white palette seems monotonous and one-dimensional to you, play it up with layers of off-white colors like a cream or beige. These off-white Contemporary Cylinder Ceramic Sconces will fit right in with your coastal interiors with its crisp lines and simplistic design. 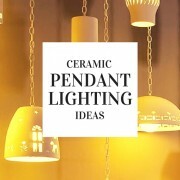 If you are lucky enough to have your home near the water, ceramic light fixtures are the perfect choice because they can withstand salty air. 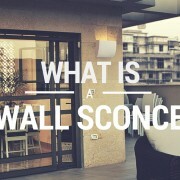 Shells are a common element in the coastal style because of their simple elegance and beauty. Does that mean you can’t have bright colors in your beach interiors? Nope! Bring the ocean right to your home with some unexpected splashes of oceanic blues and sea greens. Fabby Lighting features 40 earth-inspired blue, neutral and green hues which echo the tones of the sky, sand and sea. One of our favorite Fabby colors is Honorable Blue which calls to mind the essence of the ocean and sky. 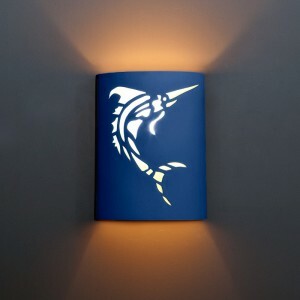 Pair the color up with a playful Marlin wall sconce. If you already have a favorite beachy color, you can also paint any of our ceramic light fixtures with any basic latex paint. Just make sure to stay consistent. 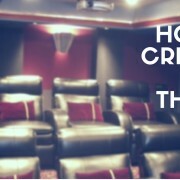 Using too many color schemes will create too many personalities and cause clutter. 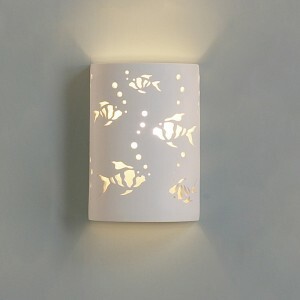 The Beta Fish with Bubbles Ceramic Cylinder Sconce is a playful decor to add to any coastal home. A few well-chosen beach accents can evoke the sense of the coast. 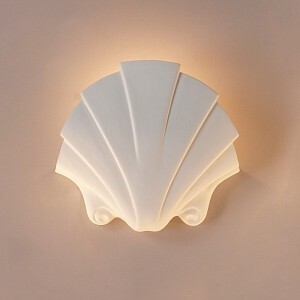 Add a dramatic Seashell Themed Sconces to your living room or fun and whimsical Beta Fish and Bubbles Cylindrical Sconces in your bathroom. Don’t overdo the nautical décor; the coastal lifestyle is comfortable, relaxing, and unfussy so you will want your coastal style to reflect that. Use just enough coastal accents to lighten up the home, but don’t overkill it with a home full of beach-themed décor. It’s impossible not to love the understated charm of the coastal style. The white open space, shades of oceanic blue, and hints of fun seaside accents bring back those sweet summer memories of the ocean. 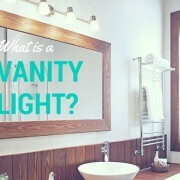 Visit www.Fabby.com to shop our extensive collection of lighting that’s perfect. Really amazing, but how much it costs ??? I had the same Beta Fish with Bubbles Ceramic Cylinder Sconce lighting fixtures at my daughters blue bathroom. installed by All Bright Electric Inc.they added smokey white – yellow lighting that make it more dramatic and playful for my kids bath. Nice article Iris! Shells are pretty cool! Do they come in different colors?